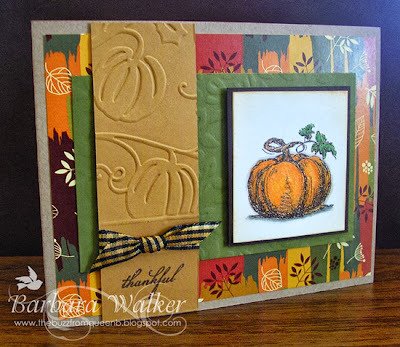 The Buzz: Fall is in the Air ~ Time for Autumn Cards! 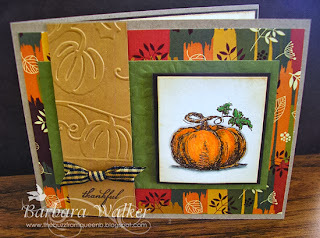 Fall is in the Air ~ Time for Autumn Cards! Hello Friends! Autumn is on the way! If you've been following my blog for awhile, then you'll know that this is my absolute favorite time of year! My whole attitude changes and I feel like I can conquer the world! Ok...maybe that's a bit dramatic, but, I really do LOVE Autumn! 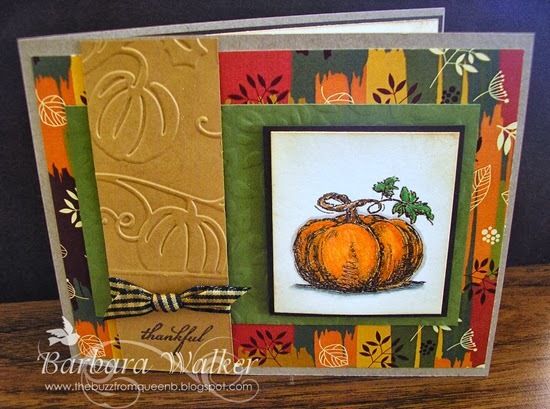 The card I am sharing today, will be the first of many featuring the new Grateful Heart StampTV Kit, from GinaK Designs. 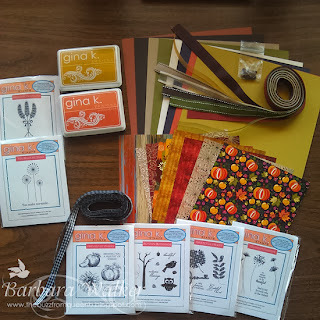 I love these kits because they come loaded with soooo many goodies; card stock, ribbons, brads and of course wonderful stamps. Here's a little peek at the items I purchased. To see a video presentation of the kit, click HERE. I stamped the sweet pumpkin image onto Ivory card stock with Versamark ink. Then, I embossed it with brown embossing powder. I colored the image with InkTense Pencils and added a small amount of water to activate the ink. After it dried, I colored over the image with an orange glitter marker. It has a nice subtle shimmer. I dry embossed the Honey Mustard and Fresh Asparagus card stock and the little 'thankful' greeting has been heat embossed. That bit of ribbon tied round the Honey Mustard, is not part of the kit, but it is a GinaK Designs product. I fell in love with that black and white gingham ribbon a long time ago and finally treated myself to whole package of it! As you can see there, it's no longer black and white. I used a Copic marker to color over it, so it would coordinate better with the card stock. A little sponging, a little strip of patterned paper, a stamped greeting and a repeat of the focal image; all of these help to tie the whole card together to create a more finished and professional look. I've also started lining my envelopes again. I used to do this years ago, but it became tedious work. 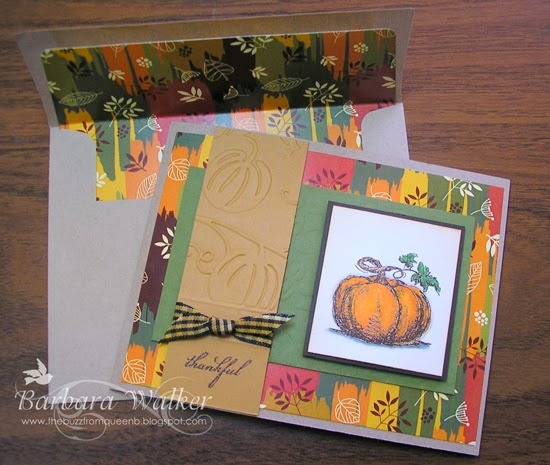 Now, I use an envelope liner die, so it's quick and easy. In addition, I stamped the pumpkin on the front of the envelope in brown ink. It gives the recipient a little 'eye-candy' as soon as they receive it and makes a nice presentation. That's all I have for today. Thank you so much for visiting me. Have a wonderful weekend! Most of the supplies are from the Grateful Heart Stamp TV kit. Many of the items can be purchased separately. Your Autumn card and envelope are just gorgeous. This is beautiful Barb. And what a fun kit. Hi Barb! What a lovely collection of goodies. I know you are going to create many fabulous projects from your kit. I DO know how much you love autumn. And your love shows in your first card posting. Beautiful, absolutely beautiful. Love how you have a complete package of happiness. The outside of the card, the inside and the matching envelope. Made me smile!